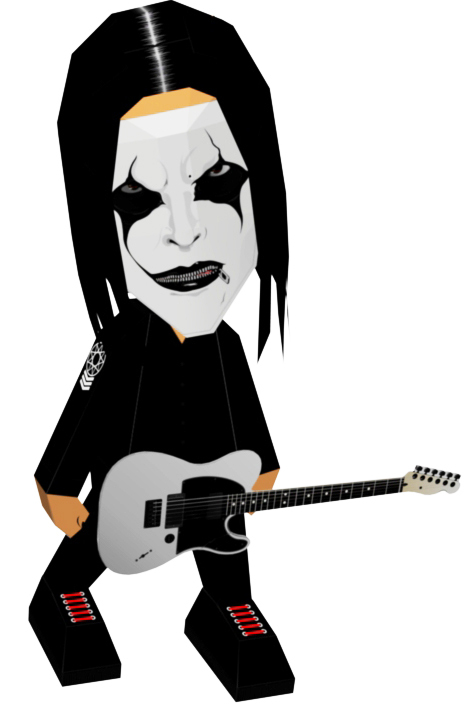 JIM ROOT - SLIPKNOT PAPERTOY!! If You’re 555 then I’m 666 . . . . [sic] [sic] [sic] . . (^.^)> . . one of my favorite bands ever SLIPKNOT !!! i love slipknot , i love papertoy, so . . i created this one . i hope u like it. stay [sic] . . . This entry was posted in Music, Slipknot and tagged Slipknot. Bookmark the permalink. Please tell me your doing the whole band? Really great job. when I go to print, it gives me total bs!!! First of all, I offer apologies for any inconvenience . . It sound like cartridge’s problem, have you tried to Head Cleaning on your printer properties ? You can clean the print head from your computer using the Head Cleaning utility in the printer software. i hope it solve the problem. but if the problem still persists, i’ll send you the JPG file . . .do you have any email address ? so i can send the jpg template. 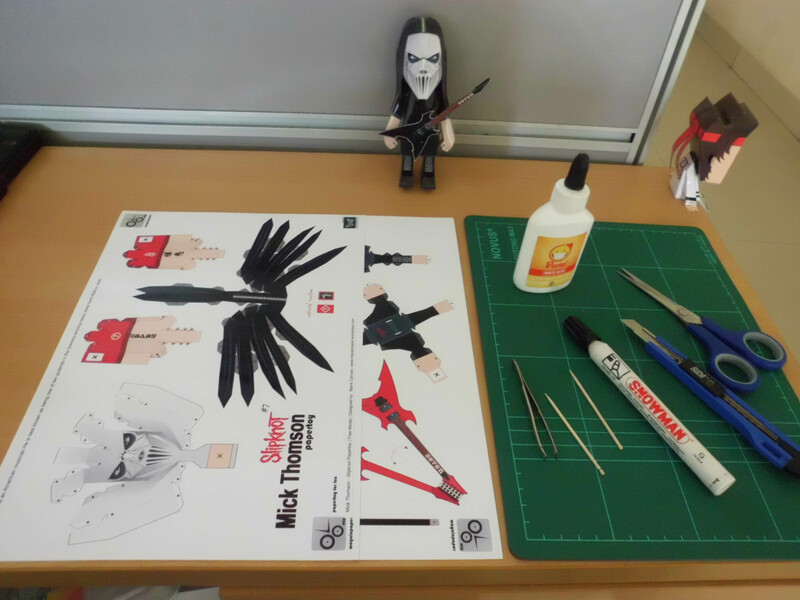 yea . . sounds great .. lol . . for the next slipknot papertoy, i’ll design . . Jordison and Drum kit . .
Amazing work! Thank you very much… Maybe you try Joey Jordison, he has a nice face and a very big drums. hi your paper toys are amazing! i have made myself a joey and mick, just wondering could you send me the designs for the corey one and the jim one please? Thankss…. wow.. u made Joey and Mick .. that was great.. thanksss…. yea.. about Jim . . i need to redesign the model . . my old papertoys are so messed up .. heheh.. i’m still learning . .
the jim one is looking great so far. do you make these from plain paper? your ones in the pics seem very shiny and thicker than standard printing paper? 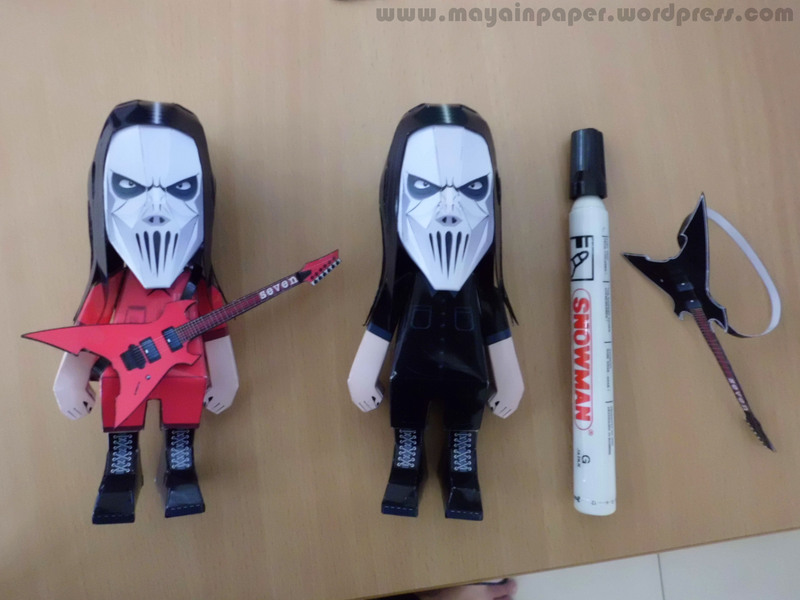 hey man did you ever get around to doing anymore of the slipknot paper toys? now u can see the image (Jim Root) at the Left Sidebar of my blog (^.^)> . .
please can you give us the link to download Corey? i can’t find it anywhere! Thanks . . i’m glad u liked it . . .
yea.. Corey is my very first Papertoy i ever made, its about 2 years ago . . but ii’m gonna redesign it . . . my old papertoys are need a lot of corrections . .hhehe . .
ok i’ll wait for corey! your works are great! hoyoo . . . kayanya keren tuh . . moga ajah bisa sempet bos . . maklum bikin papertoynya pas waktu luang aja . . . btw makasih dah mampir . .
on the pants/leg insert with the [X] [X] what was the point of putting the slipknot logo on it if it will not be shown once constructed? yea.. i really have no idea . . i’m just doing random painting . . heheh . .
Hi Brant, i just sent u (FB Message) micks template edited (jpg) file . . . i hope it helps . . . I just now confirmed to receive comments from you via email. I checked my FB messages and timeline, there’s no message nor post about the layout. Hi Thaiana . . . Dave Mustaine Papertoy .. hmm .. sounds great . . . i like Megadeath too . . hehehe . .
saya juga pake kertas foto gan tapi ga tau ketebalannya berapa? 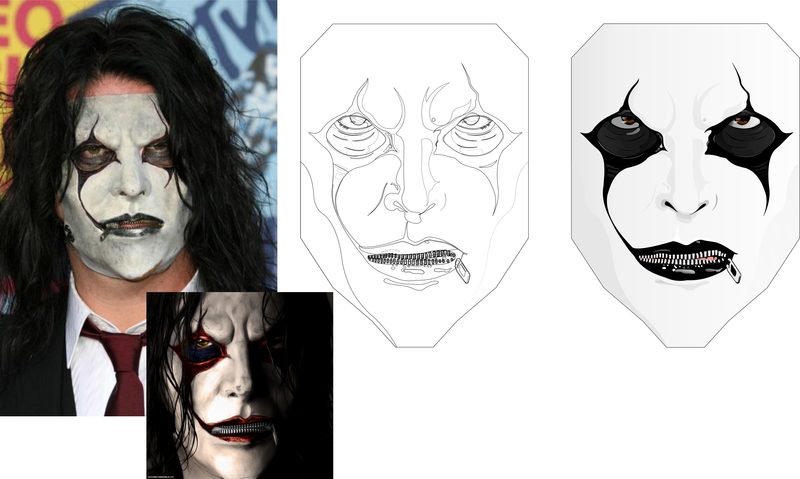 gan kalo si corey sama jims root ada designnya ga? gan klo lem yg bagus buat papercraft apa? gan james root sama corey taylor udah jadi? Preciso de alguma dica de como montar a parte preta do corpo com as pernas/botas. na parte inferior não há nada que possa ser colado no local para dar acesso as pernas. Caso alguêm possa me mandar uma foto de que parte eu esqueci de colar ou como colar ficarei grato. man i love them! but i can’t download mick and joey, could u fix the link? also MAN I WANT TO SEE COREY! !